While many organizations are keen on becoming data-driven, most focus on only a small fraction of the many types of available data. Not accessing and analyzing a fuller spectrum of data, including those from “dark data”—emails, texts, images, photos, videos, and other documents—along with traditional data sources can limit an organization’s ability to gain a complete picture of their customers and operations, and exclude them from game-changing insights that improve business outcomes. 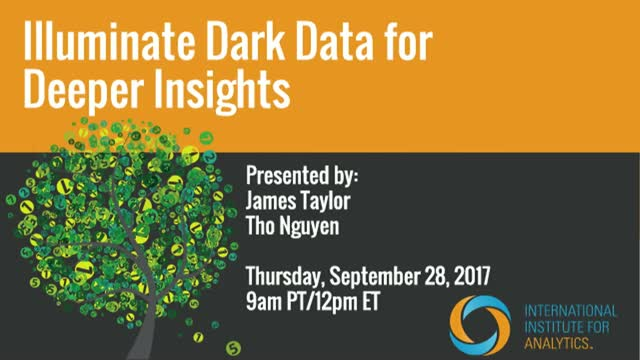 Join Tho Nguyen of Teradata and industry analyst James Taylor of Decision Management Solutions to learn about dark data and the new technologies that make it worth storing and analyzing to become a data-driven organization.